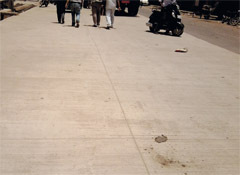 Bonded overlays are normally used for resurfacing and minor rehabilitation of the distressed pavements. The thicknesses of these overlays vary from 50mm (two inches) to 150 mm (six inches). Based on thickness, these overlays are further divided into two groups, thin and ultrathin. 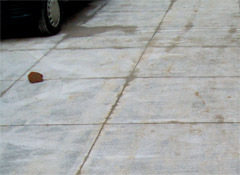 Thin whitetopping (TWT) uses a bonded layer of concrete that is 100 mm to 150 mm while an ultrathin whitetopping (UTWT) layer is of 50 mm to 100 mm thick. When utilizing bonded overlays the existing pavement (concrete or asphalt) must be in good condition without structural deficiencies and significant stresses, as it becomes an integral part of the pavement structure. The bond is made by texturing the bituminous layer. 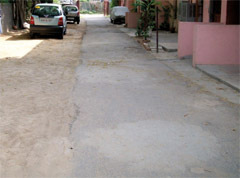 Milling the bituminous surface also helps to improve the bond between the concrete overlay and asphalt interface. 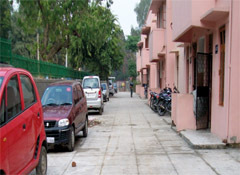 The bond between the two pavements plays a critical role for the performance of the new pavement as it ensures the concrete overlay and existing bituminous pavement to act as one structure. 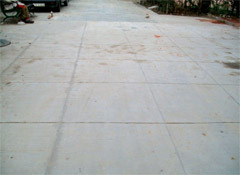 These overlays eliminate surface distresses and also provide added structural capacity to the pavements. In these overlays, no dowel bars are used for the load transfer. Load is transferred by means of aggregate interlocking. Saw cuts joints must be made as soon as possible, without delay at a prescribed spacing for the success of the overlay. Smith, T., and Fung, R., “Concrete Overlays – Sustainable Pavement Preservation Techniques Helping DOT’s Adjusting to New Realities of Shrinking Resources.” http://www.tac-atc.ca/ conference/smith.pdf, Accessed on June 8,2011.
http://www.dot.state.il.us/materials/research/pdf/ptam4.pdf. 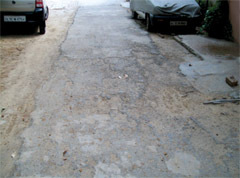 Accessed on March 8,2011.
http://www.fhwa.dot.gov/pavement/concrete/pubs/07025.pdf. Accessed on April,8 2011. Balbo, J. T. (1991). “Applications of High Performance Concrete for Ultra-Thin Pavement Overlays (White topping),” ACI Special publication, Vol. 186, pp.731-744. .
Posted on Sat, Apr 21st, 2012, in Civil Engineering. Bookmark the permalink. 4 Comments.